Yesterday, the Caccianebbia neighbours converged on Maria & Armando's to help them pick their grapes. The vendemia came early this year as Maria needs to have a minor operation and wanted the grapes picked beforehand. 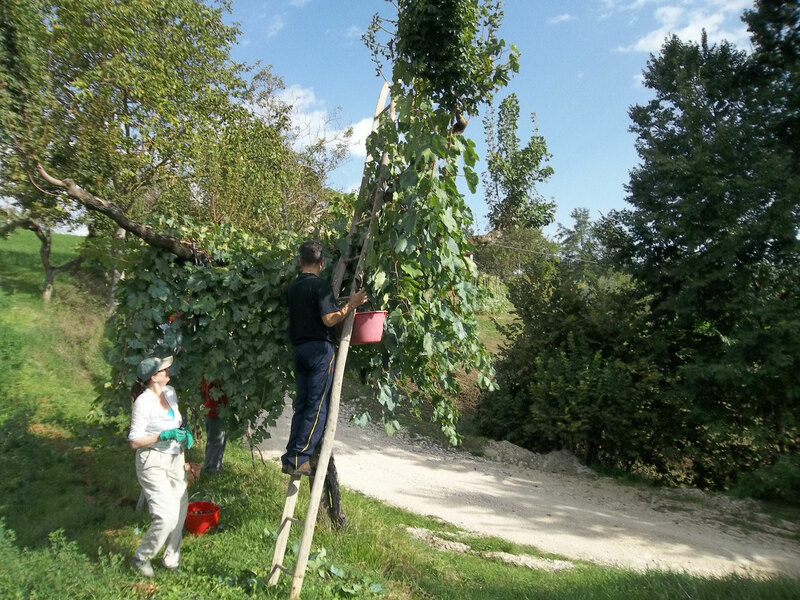 First we picked the vines along the fence then those growing over the trees, using hand-made wooden ladders. This was the normal way to support the vines as the farmers could not have afforded expensive trellising. Despite the lack of rain this summer, the grapes, both black & white, were plentiful. As we picked, Domenico exchanged our full baskets for an empty one. The grapes were tipped into plastic bins in the back of the tractor and taken up to the cantina where they were pressed mechanically. It's been about 40 years since anyone has pressed the grapes with their feet. Domenico remembers the pressers wearing clean gum boots but Armando, who is older, remembers it being done barefooted. If your feet weren't clean to start, they were by the time you'd finished! We were finished, with the grape juice (mostly red but with some white) sitting in the barrels and the bins & baskets washed, by lunch time. Maria, as usual, had been working since 5am to prepare the lasagna, her chickens pan fried in olive oil and garlic and her hand-made potato chips (of which I ate waaayyy too many.) There were slices of mozzarella, tomato & basil as well as a plain tomato salad and plenty of Armando's red wine. I had made a pavlova for dessert. We left about 4pm - very full and pleasantly tired.